Rajinikanth's Kaala, which was released on June 7, has failed to strike gold at the global box office. The collection of the flick in most regions is no match to Rajini's previous film Kabali. The collection of Rajinikanth's Kaala is not up to the mark at the worldwide box office. Although the movie has done well in a few centres, the business of the Tamil film has been largely low in most of the places when compared to the superstar's earlier movies. In five days, Kaala has grossed Rs 122.15 crore at the worldwide box office. In its home territory of Tamil Nadu, the Rajinikanth starrer has raked in Rs 47.1 crore in five days. In Andhra and Telangana box office, the movie has failed badly as the film has raked in Rs 13.1 crore. However, the Pa Ranjith-directorial has managed to do decent business despite the delayed release in Karnataka. It has raked in Rs 8.7 crore. Even in Kerala where the superstar's film often gets flying start, the Rajini's flick has collected Rs 4.25 crore. 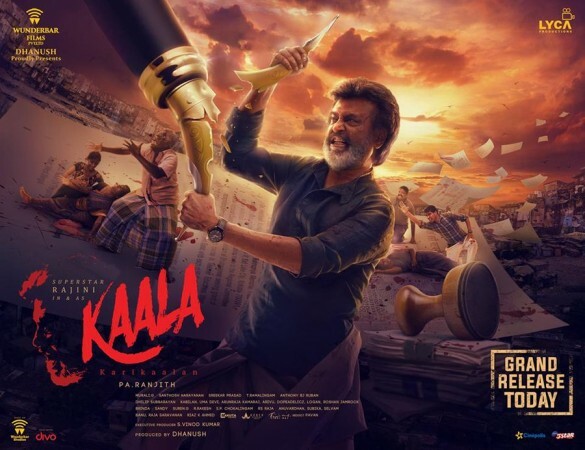 In total, Kaala has earned Rs 73.15 crore in South, while raking in about Rs 5 crore from rest of India to take its domestic collection to Rs 78.15 crore. Among the overseas centres, Kaala has done exceptionally well in Australia as it has raked in over Rs 2.1 crore. The biggest contributor among the international centres is the US where the Rajinikanth film has earned Rs 13 crore. The overseas gross is estimated to be around Rs 44 crore in five days. It has to be noted that the numbers mentioned here are estimated by trade experts and not the official collection. The total worldwide box office collection of Kaala stands at Rs 122.15 crore which is far lesser than Rajini's previous movie Kabali, which minted over Rs 225 crore at the worldwide box office. Apart from Tamil Nadu where the business of Kaala is closer to the superstar's previous film, the collection in the most of the regions is no match to Kabali. The theatrical rights of Kaala are valued at Rs 155 crore. Nonetheless, the trade experts are of the opinion that Kaala might recover in the days to come as there is a decent to good word of mouth.